SamFirm is a free, but deprecated tool which allows you to revert changes made to your phone or tablet after a jailbreak has been applied. Usage of SamFirm can be handy if you've tried out different firmwares or custom ROMs, but have decided to revert back to official releases by Samsung. 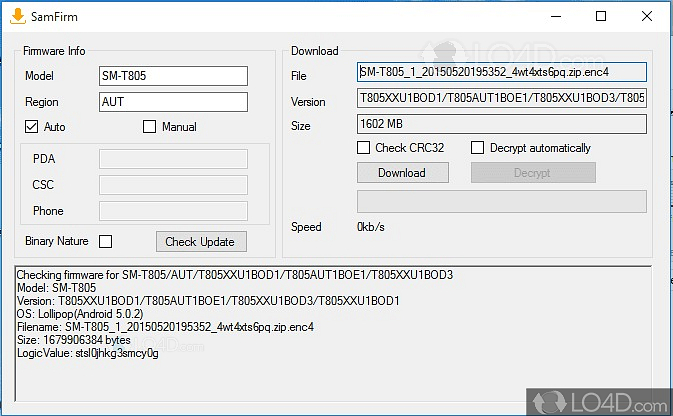 The tool is lightweight and an easy solution if you ever want to go back to using an official piece of software, especially if you're upgrading and selling your current device. 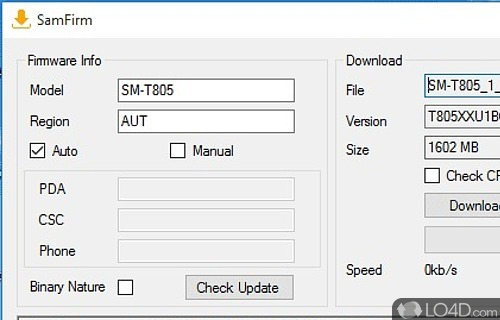 All that's needed to use SamFirm is to input some details about your device and use the tool to connect to Samsung servers to fetch the proper device firmware. You'll be required to have the .NET Framework 3.5 installed in order to use this tool. SamFirm is software which can update phone firmware. SamFirm is licensed as freeware for the Windows (32-bit and 64-bit) operating system / platform from mobile phone tools without restrictions. SamFirm 0.3.6.0 is available to all software users as a free download (Freeware). Compatibility with this revert root software may vary, but will generally run fine under Microsoft Windows 10, 8, 8.1, 7, Vista and XP on either a 32-bit or 64-bit setup. A separate x64 version may be available from zxz0O0. This download is distributed as SamFirm_v0.3.6.zip. We have tested SamFirm 0.3.6.0 against malware with several different programs. We certify that this program is clean of viruses, malware and trojans. 4.2 out of 5 based on 116 ratings.